We are launching new eco-friendly collections that will inspire you wherever you go! 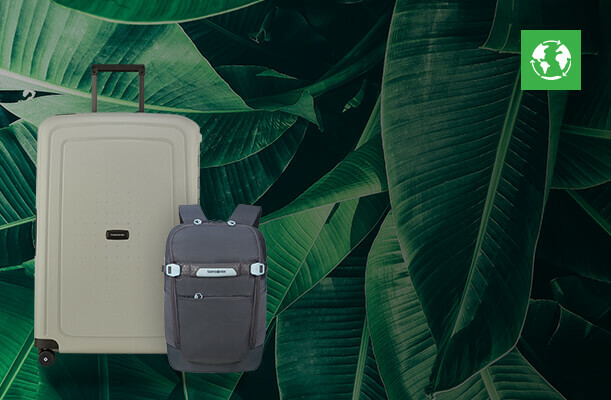 Our collections are made of innovative materials that contribute positively to our environment... Leave your ecological mark and choose between our range of eco luggage and bags! As a laptop user who is often on the move, choose a business bag with a specially designed laptop compartment. Expect great protection for your valuable electrical devices whilst providing storage for other items. Whether you are looking for a formal style for a business environment or a more relaxed version for college or leisure use, Samsonite has every option you could need including wheeled laptop backpacks. Don’t miss some of the extra handy features such as durable cushioning, anti-slip straps, comfort carry handles and practical day to day organisation. 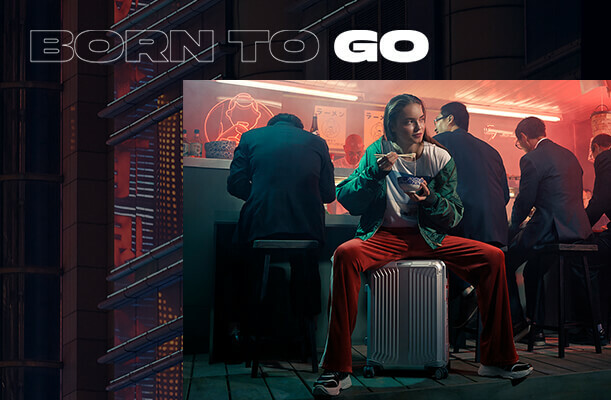 With Neopulse, a lightweight polycarbonate hard suitcase which perfectly succeeds in combining lightness and strength thanks to the patented self-reinforced design with extra protective corners. With Lite-Shock, we have once more pushed the limits of innovation by creating its lightest hardside collection with a maximum impact resistance. 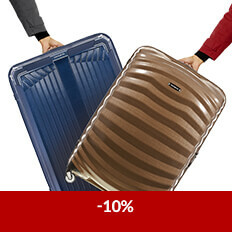 Both of these Made in Europe luggage can be combined with Paradiver Light packed with new optimised features and refreshed under the sign of aesthetic continuity and practical enhancement. This successful range is now lighter than before and comes with a fresh new look that stays true to the original. NEW LIMITED EDITION COLOUR! Paradiver Light is now available in a seasonal “Grey/Yellow” with contrasting black details. 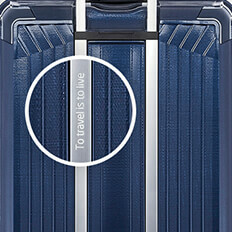 Engrave your name or a personal message on the handle of Samsonite's best-selling Lite-Shock, Cosmolite, Lite-Cube FR, Lite-Box and Lite-Cube DLX ranges. Let your suitcase be an extension of your personality thanks to Samsonite's brand new laser engraving service - exclusively available online. Not only will it help your suitcase to stand out from the crowd, an engraved Samsonite also makes a fantastic personal gift! Add your name, a life motto, a company name or perhaps a special message for your loved ones. Practical yet stylish; meet our selection of complete luggage sets for when one just isn’t enough. Made to highest standard, our luggage sets are ideal for keeping your belongings secured and getting you and your family off on your travels in style. So find your perfect set today and get your trip off to a flying start! Adopt a green lifestyle with Samsonite! To commemorate World Earth Day, we give extra attention to today’s environmental needs. It is important that we reflect on our own ecological behaviour in order to reduce our environmental footprint! A lot of change lies in the way we travel and the type of products we use. We can help you in these first steps not only by giving some small tips, but also by introducing sustainable luggage with smart and ergonomic features! We also listed the best ecotourism destinations for you and your family to get you close to the natural world! Are you ready to become a conscious traveller? Samsonite is thrilled to be named 'Favourite Luggage Brand' by TripAdvisor's worldwide community at the 2018 annual Travellers' Choice Awards.